Community Black Lives Matter Movement shuts down Mayor Garcetti’s visit to South L.A.
Two and a half weeks after his convincing victory to become the next mayor of Los Angeles, Congresswoman Karen Bass and Council President Herb Wesson joined Eric Garcetti during a tour of African American churches on Sunday June 9. While most elected officials engage the Black community for their votes prior to an election, Mayor Elect Garcetti has decided to embrace the community both before and after winning in a demonstration of commitment to the city’s Black constituents. Hailing it as the “Back-to-Basics Tour,” the new mayor embarked on a citywide venture, which included a stop at Holman United Methodist Church (Rev. Kelvin Sauls) where he addressed the concerns of more than 200 community residents and engaged in an honest and open dialog with voters. Garcetti, who takes the reins on July 1, is laser focused on fixing problems in the Black community that has been of primary concern and job creation. He then went to Trinity Baptist Church (Rev. Alvin Tunstill, Jr.Pastor), Mt. Tabor Baptist (Pastor Ticey Brown) and, Grant African Methodist Episcopal Church (Rev. Vernon S. Burroughs, Pastor) where he was greeted with an appreciative welcome from clergy, parishioners and residents. With his transition plans close to completion, the mayor elect has been delicately assembling a team that will be reflective of the city of Los Angeles. “I have seen how he has created jobs and economic development in our city, and I know that as mayor, he will do the same for South Los Angeles,” said Bass. 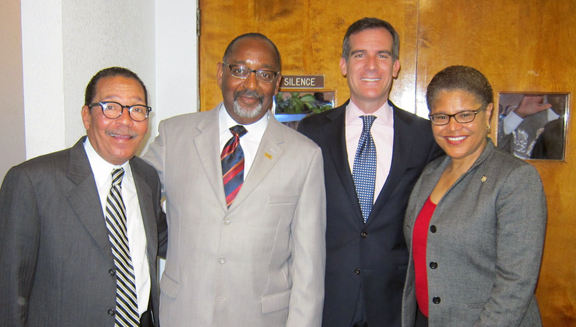 Garcetti’s is the first person of Jewish faith to lead Los Angeles. His mother is of Russian Jewish descent. His father, former Los Angeles County District Attorney Gil Garcetti, is Mexican American of Spanish and Italian descent. At the age of 42, Garcetti is also the youngest Los Angeles mayor in more than a century. He supported Barack Obama’s presidential bid and campaigned for him in Iowa in 2008, and was co-chairman of Obama’s campaign in vote-rich California during the 2012 election. Garcetti is friends with prominent Blacks such as Cory Booker, mayor of Newark, N.J. —they both studied abroad as Rhodes Scholars, and Ben Jealous, head of the NAACP — they both attended Columbia University. Councilmember Bernard C. Parks, who represents District 8 in South Los Angeles, outgoing District 9 Councilmember Jan Perry and Council President Wesson.